In 1978, Martin Scorsese captured what was billed as rock group The Band’s farewell concert appearance in the documentary/concert film The Last Waltz. This film has gone on to become highly regarded as one of the greatest – if not the greatest – concert films ever, rivaling such classics as Woodstock, The Rolling Stone’s Gimme Shelter, and Led Zeppelin’s The Song Remains the Same, and with good reason. The Band first came to major prominence as the backing musicians for Bob Dylan and the bootlegs of their jam sessions at the now famous house in Upstate New York, dubbed “Big Pink”, The Basement Tapes only furthered their status (and helped to lay the groundwork for the genre we now know as Americana). All the history aside, what makes The Last Waltz one of the greatest concert films/documentaries of all time apart from the high level of musicianship by the members of The Band is the stunning array of guest appearances by the group’s high-profile friends who joined them for their final show. In addition to performing their own hits, The Band back over a dozen of their fellow musicians on some of their biggest hits, people like Joni Mitchell, Neil Young, Van Morrison, Dr. John, and Eric Clapton, all turn out to pay their respects to this unforgettable ensemble in the history books of rock and roll. This is a concert film not to be missed. The peppered in interview segments with Martin Scorsese and The Band also shake things up and form a blueprint for concert films/music documentaries that followed such as U2’s Rattle and Hum and countless concert videos releases. The Last Waltz arrives on Blu-ray in a solid AVC 1080p encodement from Eureka Entertainment’s Masters of Cinema imprint. The film looks gorgeous, particularly for a concert film/documentary from 1978. We get a clean and detailed image with an organic, filmic appearance, good detail and colors, no issues with noise or edge enhancement and shadows look good despite a tad bit of unavoidable murkiness and low light noise from the lighting. The Last Waltz sounds fantastic whether you choose the DTS-HD Master Audio 5.1 mix, which has fantastic dynamics, good musical lows, and punchy midrange, or the LPCM 2.0 stereo track that maintains all the plusses from the 5.1 track minus the ambiance of surround channels. Musical purists may prefer the stereo, but, really, you can’t go wrong with either, and they both sound really warm and analogue. 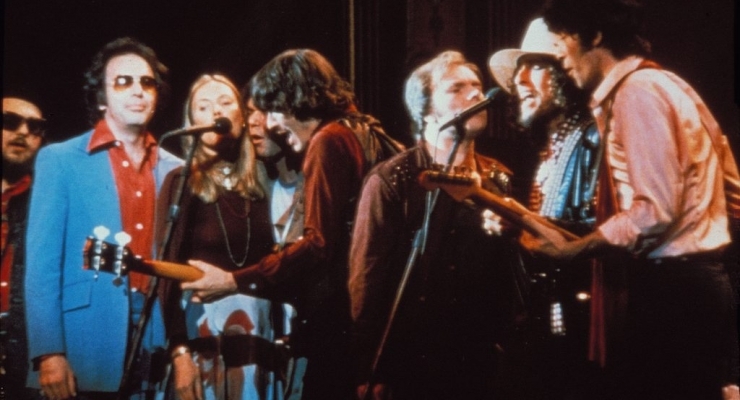 The special features included with The Last Waltz are difficult to argue against, especially if you are one the lucky few to get your hands on the limited-edition copies with the hardbound case and collector’s booklet. The commentary from Scorsese and Robertson is a must-listen track and the included outtake jam will please music fans. Good old-time rock and roll with some hot, classic performances. I have a preference for Joni Mitchell, Neil Young, Van Morrison, The Staples Singers, and Neil Diamond’s unlikely but solid entry here, but this whole film is a classic rock lover’s dream. 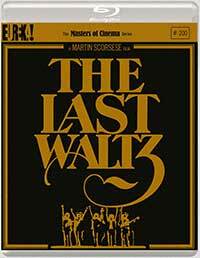 The Last Waltz in this Blu-ray release from Eureka Entertainment’s Masters of Cinema is not to be missed. A classic rock concert/documentary film from 1978 directed by Martin Scorsese marking the final live show by legendary band The Band, with appearances by over a dozen of greats including Bob Dylan, Neil Young, Joni Mitchell, Van Morrison, and Muddy Waters. The musicianship, interviews, and intimacy of the camerawork make a strong case for The Last Waltz being one of the greatest concert films ever made. This new edition on Blu-ray from the UK's Eureka Entertainment is a satisfying addition to any music fan's collection.